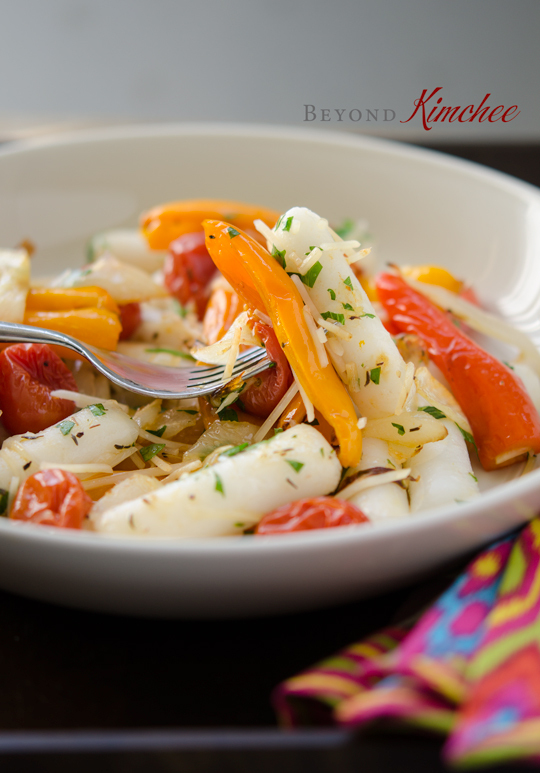 You are here: Home > Archives > Recipes > Easy and Simple > Rice Cakes with Roasted Mini Peppers and Tomatoes, and It’s Gluten Free! 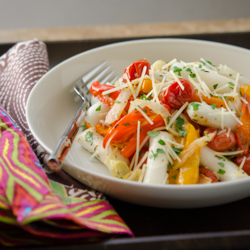 Rice Cakes with Roasted Mini Peppers and Tomatoes, and It’s Gluten Free! Rice cakes are so versatile and there are so many things you can create with. They are gluten free, fat free, and somewhat flavor free, so that you can mingle them with many flavors and satisfy serious carb cravings. When I saw bags of mini sweet peppers on sale at the store, I was instantly inspired to create something with rice cakes. I made Rice Cakes with Roasted Mini Peppers and Tomatoes. You can certainly use regular bell peppers instead if that’s what you have. Sweet peppers and tomatoes brings the great flavor when roasted. The natural sweetness in these vegetables will stand out to the maximum and you will love the flavor together with rice cakes. This is a very simple recipe and you can’t mess it up. 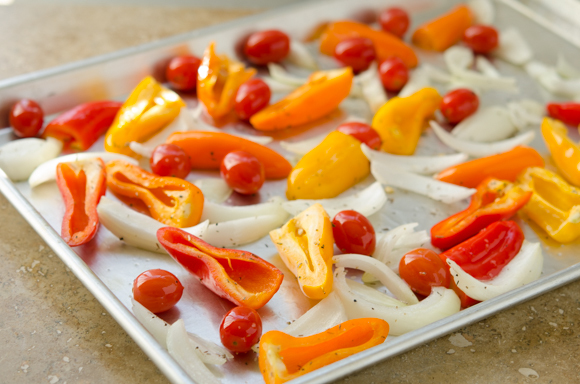 Combine sliced peppers, tomatoes, and onion in a pan. Drizzle olive oil, dried herb of your choice (I used herb de Provence), salt and pepper. Toss well. Roast them in the preheated 450 degree F. oven for about 20 minutes. You will need to toss them around half way of cooking time for even browning. 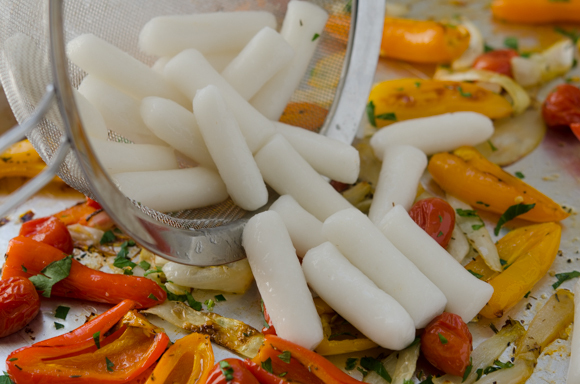 When your vegetables about to finish roasting, cook your rice cakes in boiling water for 3-4 minutes until very soft. NOTE: Fresh rice cakes are the best option in this recipe, but if they are not easy to obtain, use vacuum sealed refrigerated rice cakes and cook in the boiling water until very soft. I used the refrigerated rice cakes in this recipe. Add the rice cakes to the roasted vegetables, and sprinkle some freshly chopped parsley. Toss well. 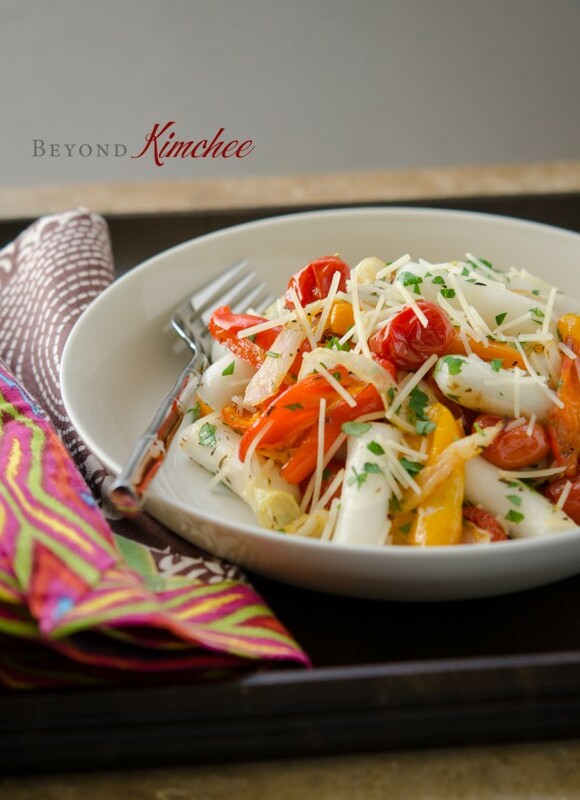 Sprinkle shredded Parmesan cheese (however much you desire) and they are ready to please your taste bud. So good! That’s all I can say. 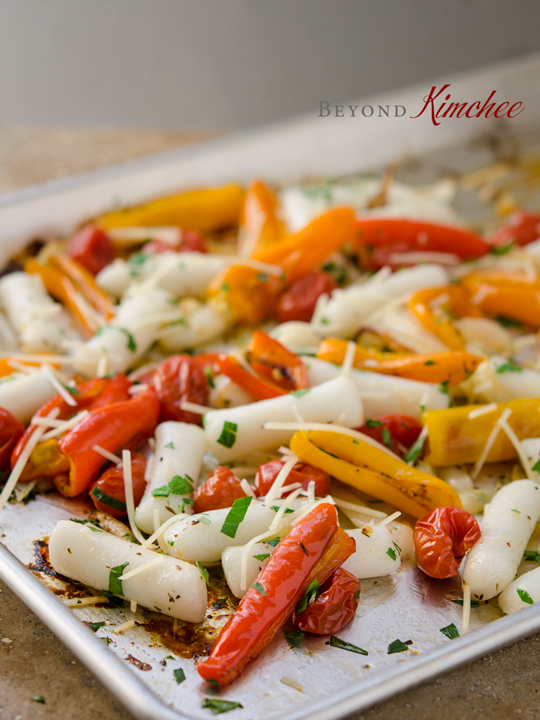 The balance between the sweetness from the roasted vegetables and the chewy rice cakes are superb, and I love the hint of savoriness from the fresh herb and cheese. A simple meal packed in flavor and nutrition, you can invite your gluten intolerant, or vegetarian, or low fat dieter, and/or even your meat loving friends over and share this fabulous Korean fusion dish for a simple lunch! You gotta serve this as soon as it is finished cooking. Rice cakes tends to go harden easily if they are exposed too long in the air. Update: One reader commented below that most Korean product that claims gluten-free are not really 100% gluten-free. In some products, she might be right. However, I just want to tell you to look for the ingredient label in your rice cake package and see it yourself if they are made with 100% rice. Rice cakes are made with rice, water and salt only. The image below are the actual rice cakes I used for this recipe. And I believe I can claim this recipe to be a gluten-free! 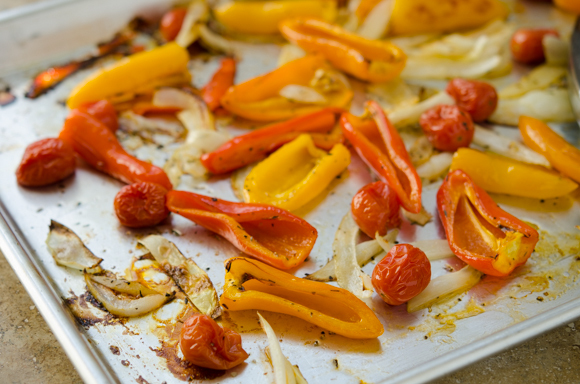 Combine peppers, onion, tomatoes, olive oil, dried herbs, salt and pepper in a pan and toss them well. Roast the vegetables for 20 minutes. 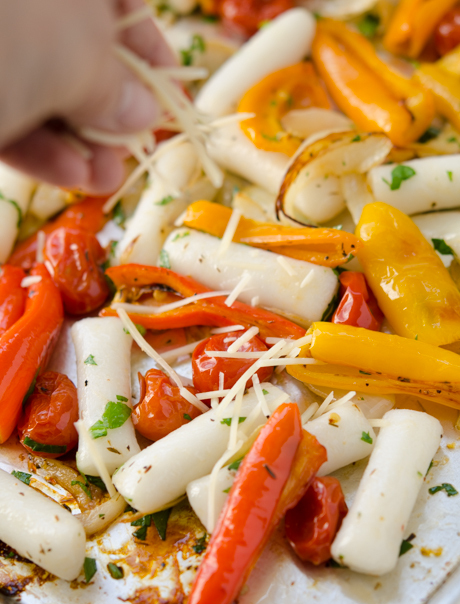 You will need to toss the vegetables during the halfway of roasting time to get the even browning. 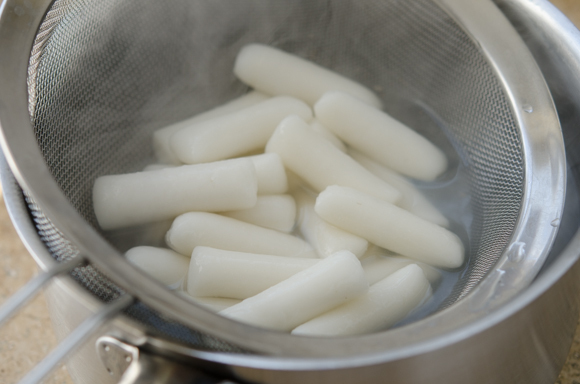 Meanwhile, cook the rice cakes in the boiling water for 3-4 minutes until very soft. Add the rice cakes and parsley (and/or basil) to the hot roasted vegetables, toss them well. Sprinkle Parmesan cheese and serve immediately. It really bothers me how often I read that these things are gluten-free. I'm sure there are gluten-free ones out there. In fact, I'm sure they were originally and are supposed to be gluten-free. However, every single brand I've ever been able to find at the local Korean supermarket lists wheat or wheat starch as the first ingredient. Personally, I've never come across any, at all, that are gluten-free. As far as I can tell, you're outright lying when you claim they're gluten-free. Please qualify your statement by adding "some," "most," or even "many" to your claim. Hi there, Please, see the update on the bottom of my post to see my reply on your comment. 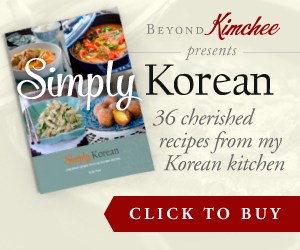 Your failure of not finding (or didn't know how to find) any gluten-free products in your local Korean store doesn't justify your claim that I was lying on my recipe. I just want you to see it yourself. Being faceless behind a computer screen does not give one the right to be nasty. Please play nice. You could have asked Holly to clarify her gluten free. How dare you come onto someone's blog and deem them a liar without first finding out more information. Holly has rightly stated the recipe is gluten free, if you are big enough to make accusations like you did, then you need to be big enough to apologise. 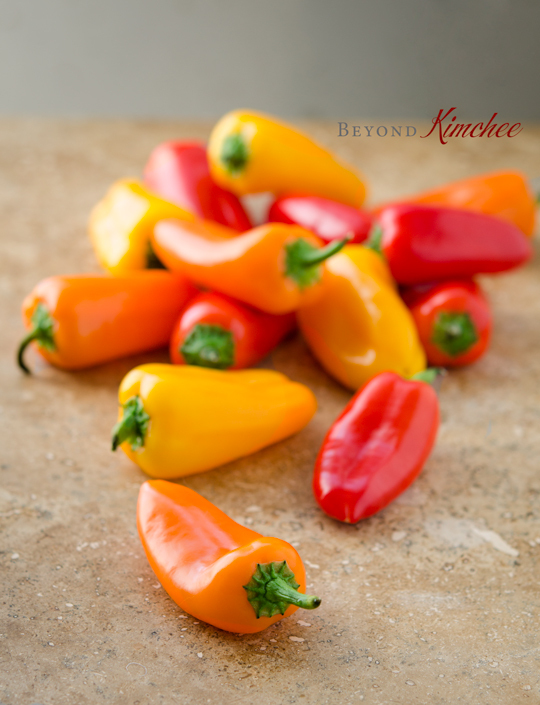 I absolutely love the flavors of sweet bell peppers! What a pretty dish! And great combo of flavors. Really interesting way to use rice cakes, too -- I wouldn't have thought of that. Good stuff -- thanks. You could have asked Holly to clarify "gluten free" before accusing her of being a liar. Even when we are faceless behind the computer screen, we are not entitled to be mean to one another. Let's play nice ! Holly, Rice cake is really yummy. I eat it around 2 months ago for the Chinese new year. And this recipe is really easy to follow. Thanks. I recently saw a package of rice cakes at the grocery store, but I wasn't sure what to do with them. This looks like a tasty recipe, so I might have to go back and get some. Hi Holly, Nice variation your rice cakes! Recently I've been experimenting with rice cakes myself, with the "coin" shape rice cakes. My husband is Chinese and I'm Italian, so I've tried to do my usual fusion: nian gao with clams (a variation of spaghetti with clams), whish I had some bottarga to grate on top. Also saute' cauliflower and green beans with cherry tomatoes. Or bacon, scallions and edamame, with chillies. Love them! 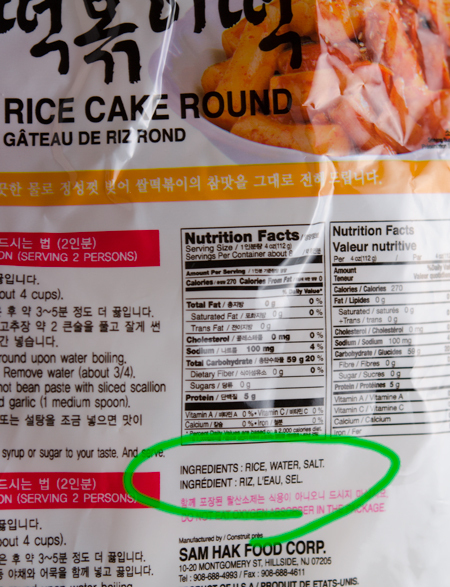 BTW, I can purchase in asian mkts, korean or chinese cakes only made with rice. Hi Francesca Chinese-Italian fusion sounds so good and I bet they are so tasty. I would give it an experiment myself soon. I am glad to hear that the rice cakes you use are only made with rice. This recipe looks amazing and I can't wait to try it. I've been looking for creative ways to use these rice cakes because my kids and I love them. 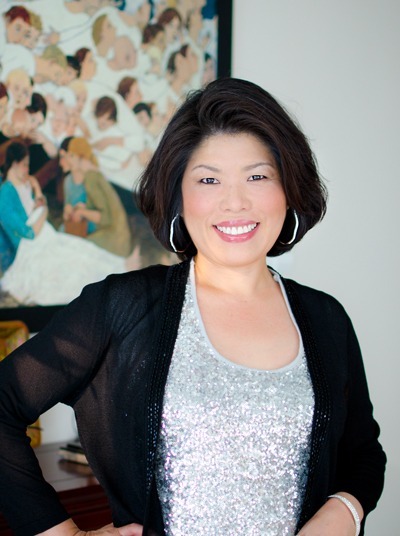 Also, as a gluten-free american that has been cooking korean food for 12 years I stand by your gluten free claim. It's all about reading the labels and looking for 100% rice products. Hi Andra You can leave out the tomatoes. Although roasted tomatoes yields very sweet flavor, if you are not keen on tomatoes, just replace with other roast-able vegetable. I think zucchini or squash would be good. It is surely a big plus to have major Korean grocery stores nearby. Makes my life so much easier and enjoyable!